Rather than pine & pout about how poorly I ran this past Sunday, I’d rather entertain you with some good stories from the race.. I was glad to have the company of my good friend, & Frenchy pro, Jose Jueland, racing with me on Sunday. Both of us trained thru this race, so there was a slight compromise on the race rather than our main goals for the season. I arrived early to the race, which is tremendously uncommon for me. Katya Meyers & I thoroughly enjoyed watching panicked sprint participants zigzag aimlessly thru transition and eventually stumble into their bikes. I love observing a T1; It blows my mind how just 5-10 minutes of swimming has the ability to disorient someone to the point of loosing all memory of where they had just racked their bike- in a clearly marked area, no bigger than a basketball court. I’m definitely not innocent of that crime. I can’t tell you how many times I’ve run right past my bike, probably looked it square in the eyes along the way and thought, “nah, that one’s not mine” then continued on with my pursuit for the correct one; Upon finding it, what seems like 10 minutes later (when in reality was probably only like 10 seconds), that overwhelming & undeniable sensation of idiocy drops like a bomb. 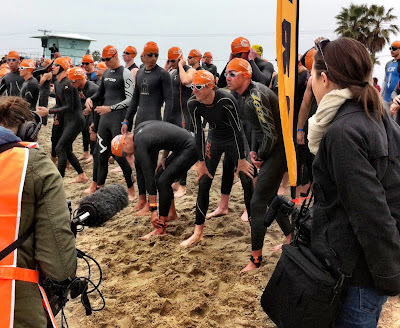 When the race started I did some obtuse dive that likely looked like a pelican swooping up a fish and my goggles fell down my face, into my mouth, then back into their original place of residing (only then filled with water). I nonchalantly veered off the front after 150 yards and quickly fixed them. I jumped back into the front group but 2 dudes already had a bit of separation occurring. I attempted to cover lost ground but it was too late and they had a gap I knew I couldn’t bridge. Once settled in, I found myself in the front of the newly formed 2nd group and started a solo journey into no-man’s-land. Around 5-600 meters out, I noticed my hand graze something that felt a lot like sand. “Hmm, wait a second”, I thought, & stood up in knee high water. I can only imagine how comical it looked from a spectator’s point of view, seeing some dude, 600 meters out in the San Diego bay, running across the water amongst a group of swimmers. I looked back to see if anyone had caught on to my discovery; not too far back I saw that Jose had just popped up and started running too. We looked at each other and started cracking up. Pretty sure everyone else followed suit and took the Jesus strategy in that 20 meter section. The rest of the swim was miserable, I had no idea where I was going. That swim course is in the same shape as the state of Texas, so navigating the buoys is no straightforward task. I’d completely stop at each buoy to find the next one. Where is Roch on his paddleboard when you need him? I’ll post some video evidence of how off course I was. Unfortunately, for everyone following my lead, I added on an extra 50-100 meters on the way in and swam around an unnecessary buoy.. hah. 3rd out of the water. I chatted with my buddy, Lars, in T1 about my time deficit to the two guys in front, grabbed my bike & started to run out. I glanced back to witness Jose entering T1 like Superman… and by Superman, I mean like Charlie Hustle sliding head first into home plate, set to knock out the catcher in an All-Star game. He nailed a sand covered parking stall bumper and won the crash of the day award. It took me around 10 miles to get going, but once I found my cycling legs I felt good. Pretty happy with my ride and the fact that monster cyclist, Karl Bordine, didn’t eat me up on a flat bike course. We must be doing something right, Mitch Hall. That’s a win in my book. I caught one of the two guys ahead of me on the second lap and entered T2 in 2nd. Just as I wasn’t concerned with my poor bike performance in the desert the other week, I’m not too worried about my lackluster run. It’s there. That’s just part of training thru races. Jose had a great run and caught me a bit before the last mile, put 15 seconds on me and it stuck. Congrats to Jason Pedersen, who won, and Jose for having great races! Thanks to all my friends and fam that came down to watch; it’s always motivating to have recognizable voices yelling at you. Thanks to my hombres, Johnny & Tom, @ B+L Bikes, for finding all my mistakes on my race-day bike setup. I am very enjoyed for this blog. I feel strongly about it and love very important information. If possible, as you gain expertise, would you mind updating your blog with more information? It is extremely helpful for me.